Posted on January 30, 2011 by Jian Akiraceo. 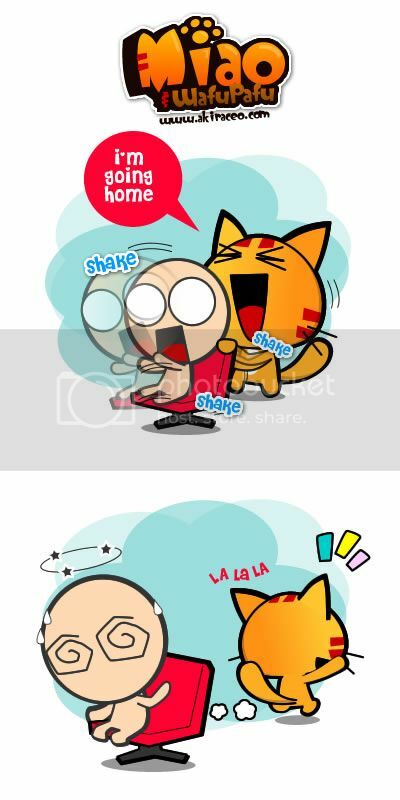 This entry was posted in Ofix and tagged balik kampung, Going home, Mischievous, shake shake. Bookmark the permalink. how safe can it be when u’re killed by ur pet Rabbit lol! 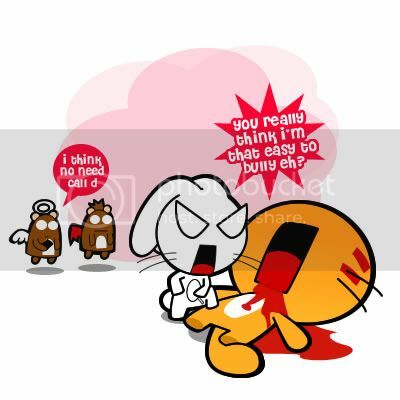 lol.. cat abuse (by the rabbit)~~ Have a safe journey back ya~ oh yea, Laksa, here I come!!!! LOL – Padan muka but gong xi fat chai! i know exactly how u feel! it’s been a yr since i came back! T.T we can has kch nommies! Haha, brutal rabbit there! Have a safe journey back Miao. Happy Happy CNY!!! i wonder what’s on the rabbit hand…..
Lol, just like my Sarawak colleague. Before she went back Kuching on Saturday, she was grinning whole day, and going “LilBear, it\s CNY, I’m going home!” every 2 minutes. Happy CNY Miao! Huat ah! haha. heppi chinese new year!!! Happy Chinese New Year! Take more angpow! Eat as much as you can! hahahha! you’re so hilarious wei. 🙂 poor miao bleeding much. happy chinese new year to you in advance! omg!! I didn’t know u read my blog! !